Concrete was cast over engineered wooden boards to give a textured finish to the walls of this apartment block in Zurich by Swiss architect Gus Wüstemann. Gus Wüstemann designed the four-storey apartment building with a double-layered concrete shell. Both outer and inner walls were cast over oriented strand board (OSB) – a kind of engineered wood particle board – to create what the architect describes as "a rough, almost organic surface". The building is named Stone H Apartment, after its distinctive H-shaped facade. 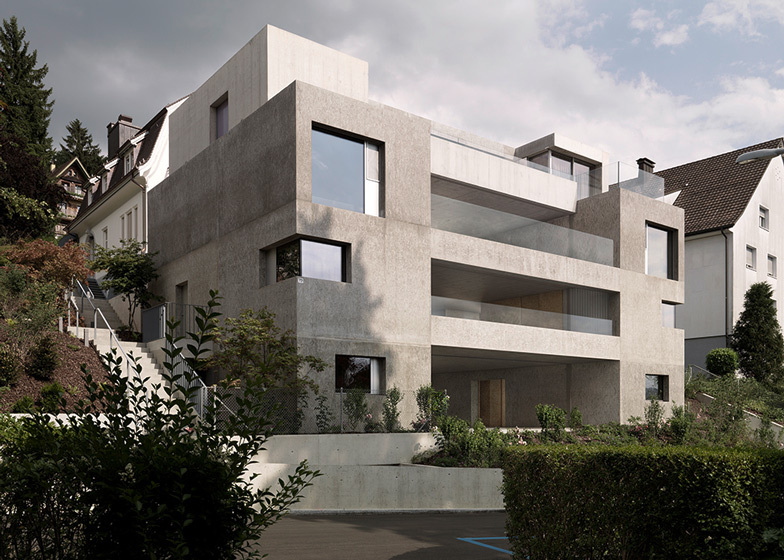 It creates three new homes in a residential area north of Zurich's old town centre. The structure was built into a slope to facilitate garden access for the pair of apartments that occupy the ground and first floors, while the two uppermost storeys form a duplex penthouse. Contrasting with the textured concrete, the penthouse floor was cast in smooth concrete and set slightly back from the main facade. Each of the three apartments is centred around a large open-plan living space with an integrated kitchen and has its own private terrace or balcony, which all face out towards the street. Large windows have been arranged symmetrically across the front and rear facades of the building, where the living spaces are located, while smaller squares of glazing on the sides and corners bring light into bedroom and bathroom spaces. "The goal was to achieve spaces you normally only get in private houses, but not in an apartment building," said Wüstemann, whose past projects include a home overlooking Lake Zurich. "We wanted the living rooms to be outside rooms with maximum views and optimal exposure to receive the light. This while keeping the upmost privacy in the dense context of the city," he said. In the first-floor flat, a concrete bench at the rear of the space also offers residents a step up into the back garden, while the ground-floor home features access to banked gardens at the front of the building. Kitchen islands for each apartment have been made using textured concrete, while storage units have been constructed from OSB to echo the imprinted surfaces of the concrete. The floors were created from poured concrete, offering a smooth surface underfoot. "The different cast surfaces enhance the feeling that the living room is actually an outer space," said the architect. In the bathrooms, the bath tubs and sinks are submerged into blocks of textured concrete. Light fixtures are recessed in the concrete formwork to create indirect illumination that can be spotted around the edges of the concrete slabs above the bath, as well as in strips over the kitchen. Photography is by Bruno Helbling and homegate.